With the mass convergence of audio, video, and IT technologies in technical operations, IP networks and streaming increasingly represent the support system for content delivery and interactive engagement. Digital signage is an ideal example of how businesses and organizations use IP networks to efficiently move valuable visual content to multiple screens in a single building (local banks, restaurants, worship and government facilities), across a large complex (corporate and university campuses) or throughout expansive terminals (airports, train stations). On a grander scale, IP networks have grown robust and sophisticated enough to carry content over IP networks in support of large retail and hotel chains. While digital signage is now ubiquitous, the power of audio for interactive engagement has been somewhat lost. However, new strategies for multimedia content delivery over IP networks are coming to market that once again bring audio to the forefront. Most digital signage deployments today lack live audio tracks so as not to disrupt the natural environment. This can be very limiting from a marketing and communications perspective, however. The delivery of audio tracks to complement the video output allows the business to leverage digital content on a far more intimate level. 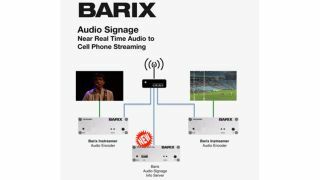 This emerging trend is now oft-referred to as “Audio Signage.” In an audio signage deployment, an analog audio source is streamed to a smartphone or tablet with very low latency, or delay. That minimal latency is the key technical element to ensuring the application works properly, and that the audio stream is synchronized with the video output. Opportunities for audio signage are beginning to take shape. Many of the earliest deployments have been seen within museums and visitor attractions to provide one-to-one audio connections at talking exhibits, providing each patron with his or her own informational audio stream. Another emerging business model focuses on audio signage as a cost-effective solution to provide live translation of presentations to the audiences within conference facilities and meeting rooms in hotels. Hotels and hospitality settings have indeed been an early success, including the hotel lobby. A guest that is waiting to check in, for example, can tune into a private stream that provides information about the hotel and its services. This creates two-way relationship between the presentation and the guest, without polluting the lobby environment with a voice track. A less disruptive background more in tune with the lobby environment music can continue to exist. Audio Signage lives on the network, streaming single- or multi-channel audio tracks over WiFi to mobile devices. In a single-channel environment, an encoding device picks up the analog audio stream and converts it into a stream delivered over the network. An app on the mobile device receives the stream and decodes it back to audio. In a multi-channel deployment, users can select from multiple audio tracks on a single screen; or separate audio tracks used on multiple screens. The former example works well for multi-lingual audio tracks, where a guest can switch between English, Spanish or French languages of the same informational program in the lobby. The latter example is especially ideal in a bar, where a patron can switch between different TV sets. Think of a hotel with a sports bar, where multiple football games might be broadcast on various screens. Multi-channel audio signage deployments require an additional server that communicates the various channel information and availability to guests on their mobile devices. In both single-and multi-channel configurations, a simple QR code provides the gateway to the app download. This removes the burden of hunting for the app, and quickly brings users into the Audio Signage environment. Collectively, Audio Signage represents a true innovation in the convergence of audio-visual, streaming and mobile technologies that, used effectively, can elevate communications and guest engagement in hospitality—and personalize screen-related audio distribution. Reto Brader is the VP Sales and Marketing of Barix.